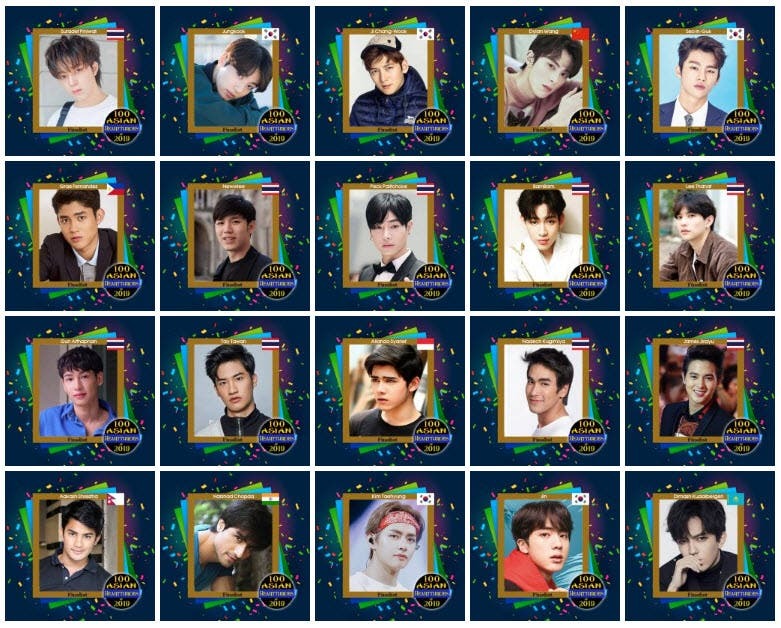 37 Comments on Voting for #100AsianHeartthrobs2019 Online Poll B Now Open! @Anonymous 1:07…. we ( t.. + thai )……..even fans of Thai artists admit…………………………………………..
WE? WE? What “WE” are you talking about? you’re not Thai so who gave you the right to speak in our name? WE never sided with anyone, why do you make stuff up? Sorry but WE admitted no such thing, what you said is completely untrue. WE came to this site to vote and to support our idols not to side with you, your problem it’s not our problem. You should be ashamed of yourself for posting such awful lies. Same goes with you…stop spreading disgusting lies. V is loved so much around the world and he deserves to win !!! Anonymous at 1:07 am : Please don’t drag the thai fans into this fight. We never took your side or your idol side, that’s a blatant lie and you know it, we love our idol, we don’t care about your idol. Why should we care about your idol? We are happy with the results and we never complained about our idol position in the poll. We never accused anyone of cheating, stop spreading such malicious lies, just to save face. Leave us and our idols alone, your fandom matters don’t concern us, it’s none of our business so please stop posting such despicable lies. I had been witnessing pollA from first day…tae #3, jk #5, jin #7. Next day jk raced to the top and lead by nearly 6 million votes before pollA closing down…WOW !! !…jk gained almost 100k votes in a blink of an eye !!! Look at now pollB…jk votes have come down so so much during the last 10 days…huge difference !!! Everyone knows and even fans of Thai artists admit that jk stans were cheating pollA, but jk fans are manipulating and accusing tae stans for cheating to save themselves. There’s nothing wrong with calling jk stans DRAMA QUEEN…you deserve it bcz we ( tae + thai ) had a peaceful voting last year until jk stans joined this year and messed up poll. You delulus always point the fingers at others even though you’re at fault, you always complain about everything, you always drag the other members just to make your bias look good, you always cry for attention, you always instigate fights, you always act like you never did anything wrong, you always play the victim card….the list goes on and on. Anonymous 12:26 am: And “cheating” is not our thing. Jk doesn’t deserve #2…he even lost poll in the first group voting, and his stans cheated pollA using bots and messed up the poll, causing all kind of troubles. Last year is much more peaceful before jk joined poll this year…and still make the most noise even after losing poll…jk stans are such a DRAMA QUEEN !!! Taehyung & BTS members are very popular. They won most of the polls anyway. Not a surprise. Same scenario will happen over and over again.. if someone will leads the poll other than kim taehyung.. his fans will complain.. and the poll will stop..the votes will not count and when he is leading, no one will complain because other fans are not an immature one like kim taehyung fans.. so in short.. kim taehyung will always win in any starmometer polls.. he will always be.. so to other nominees fans.. dont waste your time on any future polls in which Kim taehyung will be nominated because for sure same thing will happen..
And where is his prize? Where is his trophy to show? @12:16 seriously you will never accept it as you’re jealous so it’s a waste of time but you have to know the only title with votes from fans is this one. All the others are from critics and not fans. Stay preseed babe. And “cheating” is not our thing. We jut vote hard for our fave something you don’t do obviously. LAMO bunch of losers pour into comment section and make the most noise, showing how insecure they are….so pathetic !! !